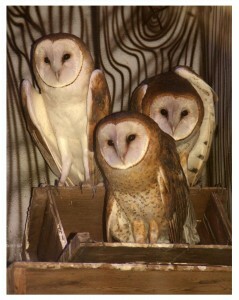 The barn owl is the most widely distributed species of owl and one of the most widespread of all birds. It is found almost anywhere in the world outside polar and desert regions. The barn owl is known by many other names, which may refer to the appearance, call, habitat, or the eerie, silent flight: white owl, demon owl, ghost owl, monkey-faced owl, cave owl, and many others. The barn owl hunts by flying low and slowly over an area of open ground, hovering over spots that conceal potential prey. It may also use fence posts or other lookouts to ambush prey. The barn owl feeds primarily on small vertebrates, particularly rodents. Conservation Status: Barn owls are relatively common throughout most of their range and not considered globally threatened. However, due to regional declines started in the late 20th century due to pesticides, barn owls are listed as endangered species in seven Midwestern states, and in Europe they are listed as a species of concern. The barn owl is pictured on the Lithuanian silver coin of 5 litas.